20th August 2017 – A near capacity crowd turned out to see Sir Mo Farah (GBR) run his final track race in the UK at the IAAF Diamond League meeting in Birmingham. Racing over 3000m on this occasion Mo sat off the early pace that was being set by Vincent Kibet (KEN) and Bethwel Birgen (KEN) but made his way through the field to join the leaders with one kilometre to run. 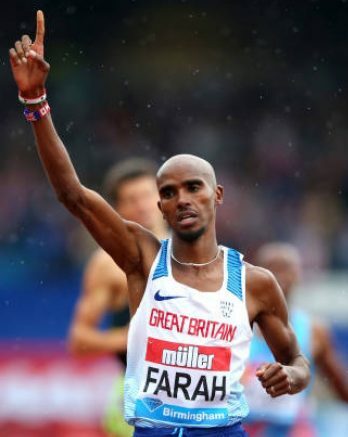 As the crowd rose to their feet, Mo hit the front with 500m left and gauged his effort, gradually increasing his pace before finally moving clear in the final 100m. Mo was able to celebrate as he crossed the line before enjoying a lap of appreciation with the fans to whom he has brought so much pleasure over so many years. Winny Chebet (KEN) gave another demonstration of her closing speed as she moved through the field over the final 300m to take second place in the women’s 1500m in a time of 4:02.24. World 5000m Champion Hellen Obiri (KEN) led the women’s 3000m for a large section of the race but was just unable to find the extra gear she needed up the home straight this time. She finished fourth with Shannon Rowbury a few strides behind in ninth. Dina Asher-Smith (GBR) continued her remarkable end to the season with another season’s best (11.13 seconds) in the heats of the women’s 100m before placing fifth in the final. Despite not feeling 100% Shamier Little (USA) still took sixth place in the women’s 400m hurdles.